The preeminent cowboy musician of the last half century gallops into the Freight to present his “Lone Cowboy Show.” Michael Martin Murphey was the original Cosmic Cowboy back in the 1970s when, along with folks like Jerry Jeff Walker and Willie Nelson, he helped launch the music scene in Austin, Texas into the stratosphere. He was one of the original country rockers with hits like “Geronimo’s Cadillac,” “Alleys of Austin,” and his biggest seller, “Wildfire.” He’s also had a long love affair with bluegrass, dating back to his time as lead vocalist in the Earl Scruggs Band. Many bluegrass greats have performed on his 32 albums, including Ricky Skaggs, John McEuen, Jerry Douglas, Mark O’Connor, Rob Ickes, and Rhonda Vincent. His songwriting has gone far beyond any single genre. His songs have been recorded by Cher, Lyle Lovett, Kenny Rogers, John Denver, Hoyt Axton, Roger Miller, Bobbie Gentry, Michael Nesmith, and the Monkees. Tonight the focus is on cowboy music. Michael grew up in Dallas, Texas, spent a great deal of time in on his grandfather’s ranch, and is still involved in ranching in Colorado. In 1990, he released the album Cowboy Songs, featuring new versions of cowboy classics like “Tumbling Tumbleweeds,” “The Old Chisholm Trail,” “Spanish is the Loving Tongue,” “The Streets of Laredo,” and “Happy Trails,” as well as his own song, “Cowboy Logic.” The Chicago Tribune called it “not only one of the finest albums of the year but also one of the finest of the last decade. Its 22 riveting cuts represent a labor of not only love but also scholarship; it raises a cult musical genre to the level of mainstream art.” The “Lone Cowboy Show” presents Michael and his music, plain and simple. “I’m a songwriter first,” he says. “A good song shouldn’t need a lot of production and bells and whistles. 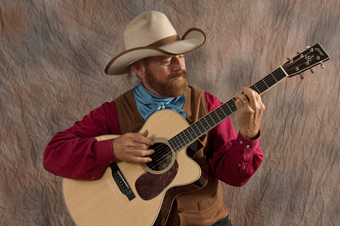 The format of this show is fun for me because I get to share these songs exactly the way they were written.” It’s a great batch of songs by an inimitable performer – don’t miss the chance to hear Michael Martin Murphey at the Freight!